This is a great article about the Ford Transit that will be arriving in the Spring of 2014. I dont agree with the writer that the Econoline is wretched…but it is time to replace this model. Enjoy! There’s a big shakeup taking place in the full-size van and truck market as Ford prepares to replace its wretched Econoline with a far superior vehicle called the Transit. 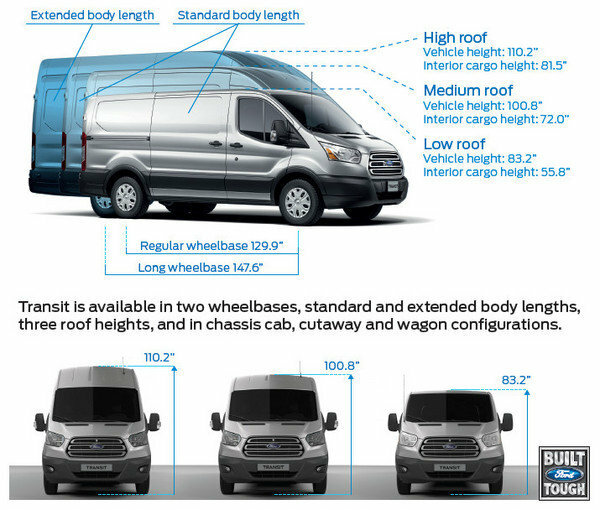 At first, the setup for the new Transit seems all wrong, as a uni-body is the polar opposite of the traditional body-on-frame truck construction. The Transit is indeed a big change for a group of hard-working van buyers who are scarily familiar with all the gritty details of the Econolines they’ve run for the last 50 years. The Transit, at first, looks like a botched Euro import, but in fact, Ford’s spent years of planning, engineering and customizing the global Transit line to make sure it answers every question asked of the Econoline by American van buyers. Part of the admirable and smart “One Ford” strategy, the Dearborn teams take a long, hard look at which of their worldwide models is best fit to tackle global challenges. In the case of the Mustang, it turns out Europe has been clamoring for it all along, so the next-gen car will be sold in Europe and in many more global markets than ever before. In the case of the large commercial van market, the Transit is simply a far better model than the Econoline in terms of fitness for purpose, modern safety and efficiency needs. Yes, it is a V-6 uni-body without off-road options or the four-wheel-drive system of some Econolines. As we’ll discover over the full review of the lineup, these things bring only benefits but keep the core attributes: a dozen plus different body styles and engine configurations, massive passenger or cargo payload ratings, better performance and economy, more comfort, more tech and finally, more safety. As Ford educates and comforts the long-trenched Econoline market, the two models will briefly overlap before the eventual phase-out of the E-series altogether after 2015. Let me be the first to say it: good riddance Econoline! 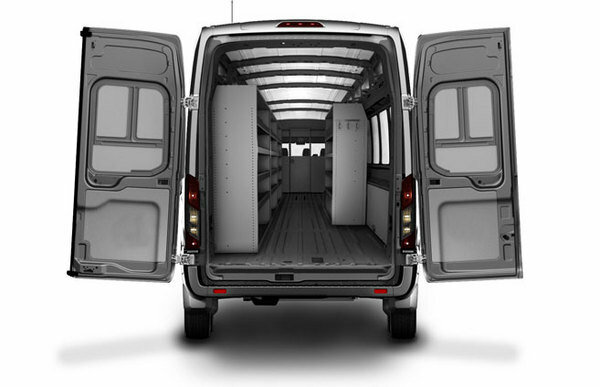 Click past the jump for the full review and image gallery of the 2014 Ford Transit. There’s no amount of styling that can disguise the utilitarian shape of the Transit, but up front it features some striking proportions and a slanted cab design for the first time. There are large reflector headlamps flanking a massive, grinning trapezoidal grille with horizontal chrome slats. The black plastic bumpers certainly fit the Transit’s work-van mission, as does the enormous windshield for visibility and the hood scoops just below it. 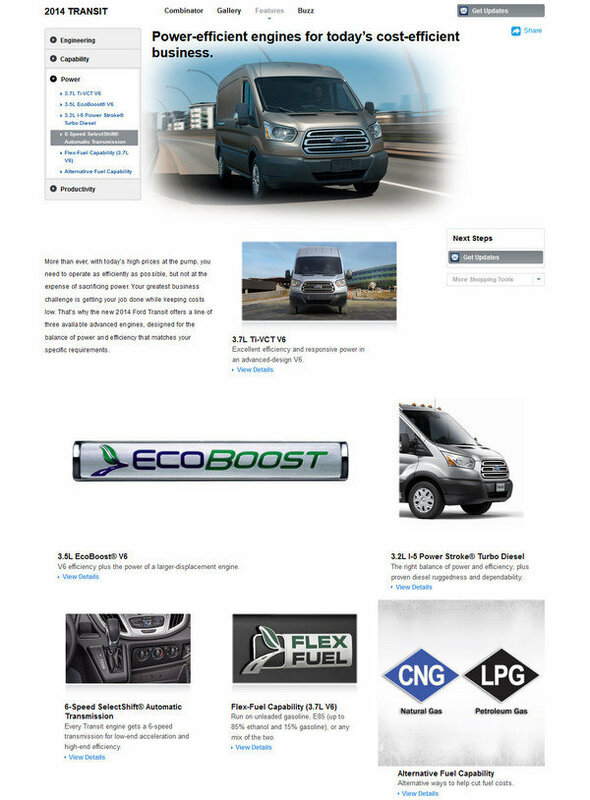 The Transit online configurator is pretty wild because of all the variations available in wheelbase and roof height, as well as configurations for passengers or cargo. Three lengths and three roof heights are available, with the middle option from each proving the most palatable. Moving to the profile of the vehicle, the slab sides are broken up by a modest swage line running the full width of the van. Modest fender flares and some interesting creases break up what is a large, blocky shape. In terms of physical presence, the Transit is far lower to the ground than any previous Econoline, but the small wheels look seriously overwhelmed by the huge mass of van above them. The black plastic molding extends across the body sides and meets another scratch-resistant bumper out back. From the rear view, simple vertical taillights ride on the outmost edges of the truck. 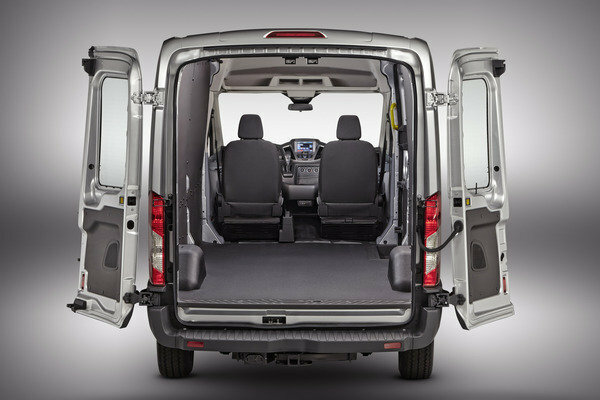 That lower ride height and steel uni-body construction allow a door opening that spans the full width of the vehicle and offers an extremely low floor and loading area. The doors swing out 180 degrees at minimum and up to 270 degrees in certain configurations. This interior wins the most improved award, hands down. The style echoes the latest Focus with technical surfaces and a great, compact steering wheel with Ford’s latest twin multi-function pads controlling the infotainment. Impressively, MyFord Touch will be an optional feature for the Transit. Even getting a CD player with decent speakers in an Econoline is a challenge, so this is big progress. Other technology solutions are available, including Ford’s fleet management tracker, called Crew Chief. This allows the, ahem, crew chief back at the home office to monitor vehicle data and locations from afar, cutting wasted driving expenses and increasing productivity. 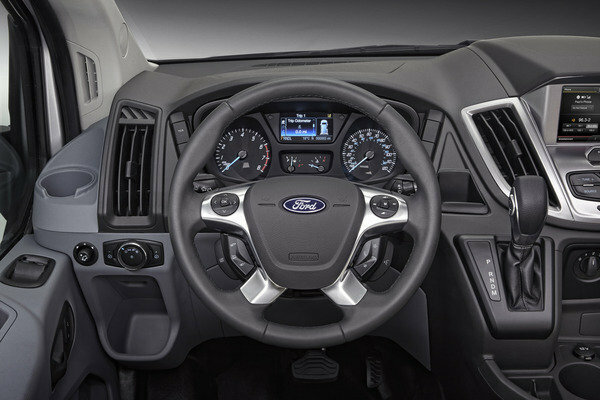 Ford’s controls couldn’t be simpler to use: the left pad controls the gauge cluster info screen while the right pad controls the central screen. The automatic transmission’s gearstick is right where your right hand falls easily, and offers more control than the old-fashioned column-mounted shifter. Vertical air vents and a plethora of storage areas will easily hold any pocket junk, and there are also five dedicated cup holders up front and four additional wells designed to fit water bottles. Evidence of the Transit’s European sophistication abounds, especially with the adjustable headlight beams. The twin bucket seats are flat but comfortable and feature easy adjustments with giant adjustment controls that are easy to reach. At the lower end of the dashboard are twin USB inputs/charging ports, twin 12V sockets (plus one in the back), A/V component inputs and an SD card reader. Another nod to the Transit’s utility mission are the built-in cabinets and bins that are options on the cargo models. On the high-roof models, the space above the front seats is put to use with a sturdy shelf built in as standard. In terms of interior specifications, the passenger model has huge windows that seem almost twice as tall as the gun slits in the back of an Econoline, affording a great view and helping relieve motion sickness when packed in the back. The minimum seating for passenger Transits is eight passengers, increasing to 10, 12 and 15 with the varying body styles. A single entry on the passenger side can come as twin swing-out doors or a sliding door. Buyers in this market often have very specific needs for the vehicle that are almost never the same across the board. As such, the Transit’s mechanical specification is also wildly configurable from the base 3.7-liter V-6 to the top-end 3.5-liter EcoBoost and 3.2-liter in-line-five diesel engine options. Rear-drive is standard and buyers needing four-wheel-drive will be directed to Ford’s extensive F-series line of commercial vehicles, all of which can be loaded with off-road goodies. Horsepower and torque ratings are not finalized yet but expected to stay consistent with the engines already in use across the Ford portfolio. This means a 3.7-liter making roughly 300 horsepower and pound-feet of torque, the 3.5-liter twin turbo EcoBoost pumping out 350 horsepower, and the diesel making closer to 200 horsepower but a powerful 350 pound-feet of torque. For the vast majority of Transit owners, the base V-6 offers plenty of power, a huge 25-percent jump in efficiency, and acceptable towing and hauling stats versus previous Econolines with Ford’s older 4.6-liter (revvy but gutless) V-8s. All engines are paired with Ford’s six-speed, torque-converter automatic transmission and there’s an option for dual rear wheels, increasing payload to an immense 10,360 pounds GVWR in top spec. LNG and CNG prep kits are offered, but not a full conversion to run natural gas. The European market Ford Transit Custom earned a five-star crash test rating from EuroNCAP, the regulatory body similar to the NHTSA here in America. The NCAP test is traditionally much harder than U.S. crash tests, and such a good score from a commercial vehicle is rare indeed. 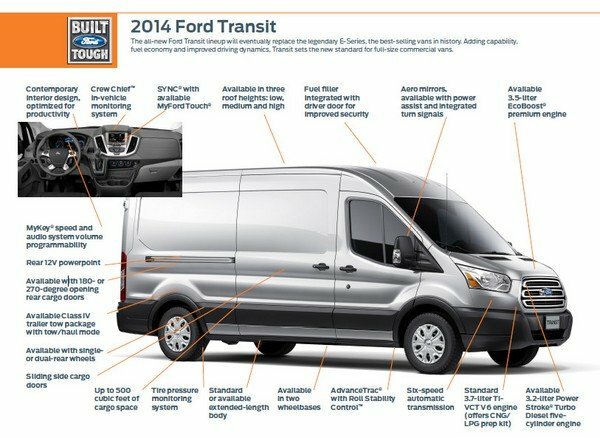 In the U.S., Ford predicts top marks for the Transit as well. The Transit packs four-wheel discs with ABS as standard, as well as their stability control system with rollover mitigation technology. A tire-pressure monitoring system is standard as well. Typically, once a truck passes a certain weight rating, it is exempt from safety mandates, most crash testing and corporate average fuel economy standards. Having learned their lesson from the Firestone debacle, Ford is including car-like safety electronics that go above and beyond federal guidelines for trucks. The Transit is not on the Ford price books yet but the range should mirror today’s Econoline vans with a 10-percent increase to account for all this new tech. Base prices are expected at $27,000 for the shortie, low-roof 3.7-liter, up to $47,000 for the extended wheelbase, high-roof diesel. As with other Fords, the Power Stroke diesel will likely be a costly stand-alone option that adds nearly $8,000 to the price, but doubles the fuel economy and range from the 26-gallon tank shared by all engines. As well as competing with the Econoline (initially) and Chevrolet Express, Ford is prepping for a hard-fought battle with Ram’s upcoming Fiat-based Ram ProMaster. 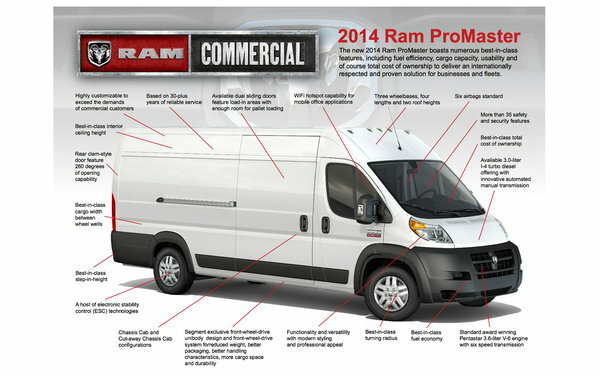 The Ram ProMaster replaces the Mercedes-supplied models with another giant (but cheaper) van from Europe’s commercial markets. Less is known about the ProMaster’s mechanical configurations and arrival dates, but diesel and gasoline powertrains are expected as well as modern Chrysler-based telematics and infotainment. Considering Fiat’s current cash crisis is delaying models across the board, the ProMaster will likely lag at least a year behind the new Transit in dealer showrooms. 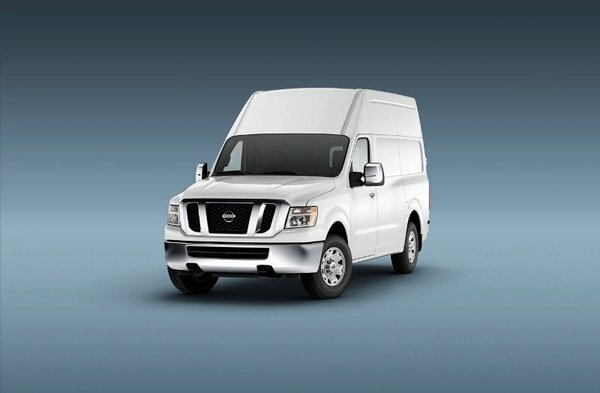 As shoppers in this market broaden their horizons, the Nissan NV may also become more appealing. Much more like the Econoline with V-8 power and body-on-frame construction, the Nissan offers some advantages in rough terrain but also has far worse noise, vibration and harshness ratings and a bucking-bronco ride quality. The NV is also offered in passenger or cargo variants with multiple roof heights, but it’s been a market flop and the future of the entire Titan-based line is in jeopardy. Ford has done a really good job integrating the Transit into the U.S. lineup and is heavily invested in its long-term success here. Building the van in the U.S. was critical to avoid price fluctuations of foreign assembly, and also ensures that large government agencies can keep buying them. Most federal and state law-enforcement operations are prohibited by law from operating vehicles not made domestically. But the Transit is far more than a Border Patrol or Airport Express shuttle. It’s a cunning and bold answer to the future of commercial business in the United States. Much like the largest jet liners, the cost of entry is almost irrelevant versus fuel economy in the full-size truck/van segment. These vehicles do so many miles that fuel costs are a huge operating expense for fleets and sole proprietors alike. In this regard, the Transit is well-positioned to ride out any future gasoline price spikes. 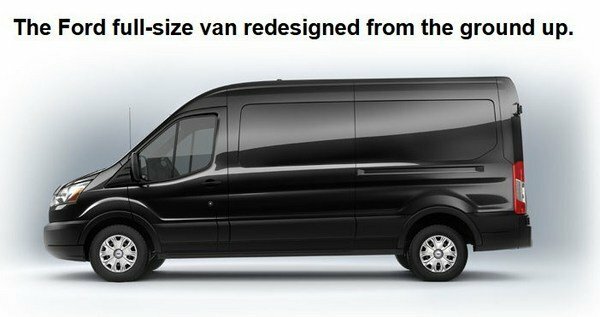 On the comfort and convenience front, the Transit will be the most civilized large van ever created. The biggest hurdles the Transit is likely to face are buyer perceptions that perhaps the truck is not as strong or durable as Econoline vans. The truth is, the Transit will out-haul, out-mile, and out-last all those nasty and awful Econolines – all while providing a comfortable cabin and tech solutions the 1980s-era E-series couldn’t fathom in its wildest dreams. Any skeptics or Econoline drivers will be convinced within the first block of the test drive that the Transit is the future of American commercial vans. Isn’t there room for some batteries or a mild hybrid AWD setup? The familiar van that delivers packages or shuttles you to the airport is about to change in a revolutionary way. 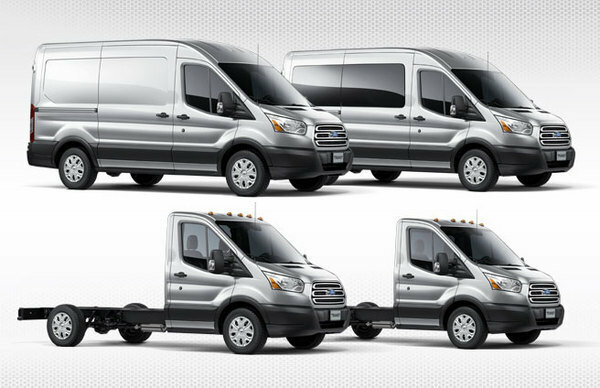 Ford’s all-new full-size 2014 Transit van will provide professional tradesmen and commercial fleet customers with unmatched fuel economy, innovative new configurations and leading versatility in the expanding commercial vehicle market. “The all-new Transit is a game changer,” said Joe Hinrichs, Ford’s president of The Americas. “Transit raises the game for our customers in North America and around the world with even greater work capability and significantly lower operating costs, helping improve their productivity and bottom lines. These, literally, are the vehicles people trust and rely on for their livelihoods.” With global commercial vehicle sales expected to grow by 4.8 million during the next several years to 21 million units annually by 2017, Transit represents a major opportunity. Ford is the second-largest commercial vehicle manufacturer in the world and best-selling commercial vehicle brand in North America. The company is leveraging its One Ford product strategy to meet the needs of Transit customers on six continents and in 116 markets with vans that are Built Ford Tough, more fuel efficient and even more capable. Transit joins the most fuel-efficient lineup in Ford Motor Company’s history. Ford will offer eight vehicles rated at 40 mpg or higher in 2013 – double the 2011 total, and more than any other automaker. Ford tops Toyota in fuel economy in every segment in which both companies compete. Transit is born from a combined total of nearly a century of hard-earned experience delivering two distinct full-size vans to customers in North America, Europe and other global markets. For North America, Transit eventually replaces the E-Series nameplate, first sold in 1961 as Ford Econoline and America’s best-selling commercial van for 33 years. In other global markets, this all-new vehicle will replace today’s popular, market-specific Transit models, first sold in 1965 and the best-selling commercial van in Europe.